We stayed at the Los Alisios Apartments. They are very large so plenty of space. In the bedroom there were 2 double wardrobes, the bathroom was massive, the lounge area was good and there was plenty of seating. A 4 ring cooker; everything you needed for self-catering. The hotel is at the back of the resort but we found several shortcuts to get to the beach. It is quite hilly but every time you go out the hills get shorter. The staff are fantastic, cannot do enough to help you. Would we use this hotel again? Yes. Apartments were very spacious especially as there were 4 of us in a room. They were clean and tidy and cleaners came in every day except Monday (i think). Pool area always kept clean, plenty of sun loungers, they didn't cater for the English much, but we never stopped on the complex of a night so wasn't too fussed. We stayed here for 14 nights and to be honest it was not our choice we had to change at the last minute as our apartments had closed but, these apartments are ok. We had 2 one bedroomed apartments and they were huge it was the usual kettle toaster and cooking rings in the kitchen, bathroom was nice and big with shower over the bath and a nice big mirror in the bedroom there were twin beds and again a lovely big mirror for us girls doing our hair. The livingroom was a good size with a tv with a few channels. The balcony was a good size too. The pool area was lovely and clean and there was plenty of sunloungers no matter what time of day we went to the pool. The cleaning was not great but it was ok. The beds and towels were clean and changed regularly. I would stay here again even though the apartments are up a slight hill. I have to say though there is no entertainment for the british it is all for the french. This did not bother us but, some other guests did have a problem with it. We stayed here for one week in December .The Hotel is very clean with a nice pool area. The furniture is a bit dated in the appartment this certainly was not a problem.It is quite a way up the hill but this did not worry us to much, thought it was a good way of burning off those extra calories we had indulged in. The staff were excellent and the bar area very nice .In all we had a lovely week at the Alisios and would stay here again. Very large rooms clean and basic. Great location just away from hustle and bustle but close enough to enjoy beach or shopping. Staff very helpful with anything. We needed a cheap n cheerful sunshine break and thats exactly what we got at the Alisios. 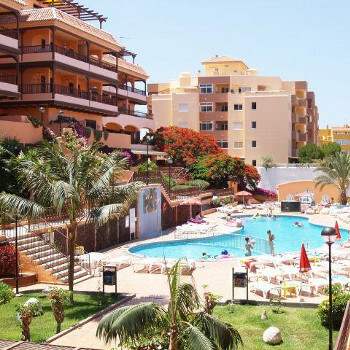 This was our first visit to Los Cristianos and it gave us chance to explore the resort and weigh up hotels etc for our summer holiday. The basic apartments were indeed dated and desperately in need of some TLC, yet the generous size of apartments and the pleasant helpful staff more than made up for it. The position at the back of the resort ensured we got our daily exercise walking into the centre. The the sea views from the balcony were fab! Lack of entertainment meant loads of quality family time. Would go back at this time of year again for a bargain break. Largest apartments we have ever stayed in but could have done with a touch of paint and updated furniture. Nice sized balcony with furniture. On a very very steep hill, ok going down but a nightmare if you have children on the way back up. On a number of occassions used a taxis when we returned to the hotel, each time were were charged a different price ranging from 3 euros to 6 euros. The staff were excellent especially the reception staff. Nothing was too much trouble. Even though there was over 40 children staying at the hotel there was not bit of entertainment. The only bar in the hotel closed at 10pm every night. Rooms are very spacious, had a room over looking the pool area which was a bit grubby and small, your practically on top of each other. It's on a hill and it takes 25mins to walk into Los Cristianos. Wouldn't come back to these apartments again.